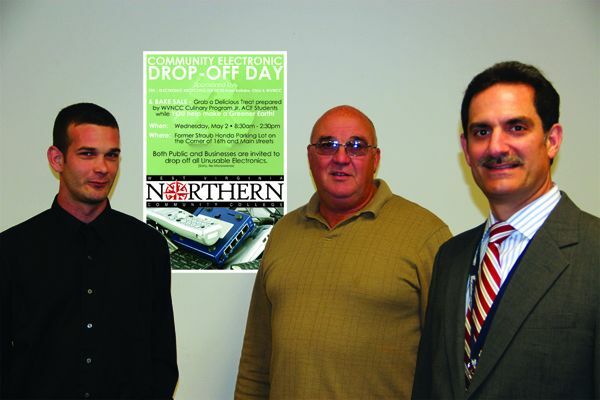 A Community Electronic Drop-off Day, sponsored by ERS of Bellaire and the Wheeling campus of West Virginia Northern Community College, will be held from 8:30 a.m.-2:30 p.m. Wednesday, May 2, in downtown Wheeling. Electronics Recycling Services and WVNCC have partnered to offer the free service in the parking lot of the former Honda building located on the corner of Main and Sixteenth streets. The site will become the home of a new Applied Technology Center for the college. According to organizer David Seum, an outside sales consultant for the Bellaire firm and a WVNCC employee, the event is for the public as well as for businesses to drop off all unusable electronics, except microwaves. Items accepted include computers, networking equipment such as monitors, printers, hubs, switches and cables, fax machines, typewriters, cell phones, copiers without toner cartridges, telephone systems, VCRs and DVD players, cassette players, electronic games and video game consoles, MP3 players and selected radios, among others. Seum can be contacted at 740-433-5799 or ERS at the website www.ers-international.com for a list of items accepted. He pointed out the firm is certified to provide Certificates of Destruction to businesses needing such documentation.